Trivia: Unlike most major wine grape varietals whose origin is obscured by myth, legend and time, the history of Alicante Bouschet is well known. Alicante was created on purpose to fill a void in French winemaking. Its creation was brought about by the confluence of two unrelated developments: canals and imperialism. Around the Winery: Spring is here, and with the warmer days, those final few barrels that didn’t complete Malolactic Fermentation last fall are finally finishing. This signals the next major step in the evolution of Bray Vineyards’ wines. All the barrels of each individual varietal will be racked into a stainless steel tank which achieves uniformity of that wine. Then, after the barrels are cleaned with a steam pressure washer and the wine’s SO2 is adjusted to protect against microbes and oxidation, most of the wine will be returned to the clean barrels. I say most because our winemaker, Joel Medina, will draw off and set aside several 750 ml bottles for the next important step. These samples will be representative of both the base wine and will also be available for any potential tweaking of the other varietals. At this point in the life of the 2017 crush, the wine is starting to come together. A wine that a few weeks ago just seemed clean but uninteresting, now begins to show some of its varietal characteristics and hints of future potential. Joel isn’t looking for a finished wine at this point, but rather his goal is to identify and adjust any gaps in the wine’s sensory profile. The earlier this is accomplished, the more integrated the final product. In the Vineyard: April is an interesting month in the vineyard. All the hard work of pruning and mowing is finished, and the vines are really starting to grow. In the absence of sunlight, a grapevine shows negative gravitropism; a tendency to grow away from the ground. However, with the interjection of light, the vine becomes positively phototropic, and it will grow towards light. As a climber, the vine never supports itself, so no effort is wasted on developing girth. Each cane on the lateral vine has been pruned to 2 buds. As these buds begin to develop into new canes, they will form nodes at regular intervals. Each node produces a leaf on one side and either a tendril or flower bud on the other. Thus, vegetative and reproductive mechanisms are created simultaneously, giving the vine all the potential it needs to produce next fall’s harvest. The warmth and sunlight of spring starts the process, and the object now will be to assist and direct the new growth in a manner most beneficial for each varietal. Grapevines do not form terminal buds like some plants, but will continue to grow as long as there is sufficient heat, soil moisture, and nutrients. That growth signals the next important step in the vineyard, which is suckering (also known as shoot thinning). A process that will continue in various degrees all the way up until harvest. Our annual Spring Wine Club release party will be on May 12th from 1:00 pm until 4:00 pm. Pick up your wines while enjoying some food and a relaxing environment. Eric Burns will be preparing and serving a meat and cheese appetizer mix with crackers and garlic bread using Bray extra virgin olive oil. The party is free for all Club Members (2 per membership) and is $15 per guest. Please RSVP by either email to brayvineyards@yahoo.com(insert link), or call (209) 245-6023 not later than Wednesday, May 9th. May 5th is the fourth annual Amador Four Fires wine and food extravaganza which is a cut above the typical wine tasting event. This new concept in wine and food festivals is designed to ignite your senses and is an “all inclusive” event. Bray Vineyards is excited to be participating, and we will be pouring a total of 6 wines combined, distributed in the Iberian, Italian, and Rhone sections of the event. In addition, Bray’s tasting room will remain open until 5:00pm on Saturday to offer a 20% discount on the wines we poured at the event to Amador Four Fire attendees. The special discount will also be available on that Sunday, just remember to bring along your Amador Four Fires ticket stub. It may have been both name recognition and the perception of quality that initially fueled Cabernet’s worldwide distribution as a red wine grape. From its roots in Bordeaux, Cabernet Sauvignon has migrated to nearly every major wine producing area in the new world. Cabernet’s vinicultural characteristics were certainly part of the reason. The vines are hardy, and are naturally resistant to numerous insects and diseases. The vines also bud out later than most varietals which helps avoid frosts. Cabernet also tends to produce low yields of small thick skinned grapes that present consistent structure and flavors typical of the varietal. Cabernet Sauvignon’s classic expression is as a full-bodied wine with high tannin content and crisp acidity; both of which give this varietal good aging potential. The variations on the classic profile seen in California Cabernets are more a function of the climate than anything else. Cooler climate Cabernets typically have notes of, mint, cedar, and bell pepper. Pyrazine is the compound responsible for that herbaceous bell pepper aroma. It is present in all grapes, but found in higher concentrations from varieties that have originated from Bordeaux. The compound is gradually destroyed by sunlight as a grape ripens, which is why climate is so important with Bordeaux varietals. In under-ripe fruit, the bell pepper dominates and can give the wine an undesirable herbaceous quality. Cabernet is a varietal that can reflect the style of the individual winemaker while still adhering to the recognized aromas and characteristics of the grape: in short many of us would recognize it in a blind tasting as Cabernet. These core attributes allow the winemaker considerable latitude to express the winery’s style. The grape’s small size and thick skin have a lot of phenolic compounds and tannins available. How much extraction is used is up to the winemaker. Early Bordeaux wines were often left on the skins for three weeks while the winery staff took a hunting holiday after the harvest. This resulted in intense, but extremely tannic wines that required years of aging. Winemakers also have the option of using fining agents to soften the tannins for earlier release. Fermentation temperature is also critical with more fruit expressed at lower temperatures, and more flavor components at higher ones. The final piece of the puzzle revolves around oak, which Cabernet loves. How much and what type are certainly a style statement. Oak has a softening effect on the grape’s tannins and adds another array of wood flavors to complement the grape’s already complex bouquet. The degree of toasting the barrel receives has a substantial impact on the wine, but in broad terms, American oak offers stronger wood flavors and notes of vanilla, while French oak contributes more tannins and has subtle notes of spice. Remember, if you have a question that is looking for an answer, then E-mail it to newsletter@brayvineyards.com. Tasting Room: Our tasting room is open on weekdays (except Tuesday) from 11 to 4 and from 10 to 5 on weekends. In May, the tasting room will be pouring: the ’17 Albarino, the '16 Barbera Rosato, the ’14 Brayzin Hussy Red, the ’12 "La Dama Oscura" Sangiovese, the '14 Petite Sirah, and the ’07 Petite Sirah/Zin Port. We also have a red table wine available in a refillable one-liter bottle emblazoned with Bray’s tractor logo. The Grape Harvest: The 2017 growing season will be remembered as one of the wettest on record, but in most other respects, it was fairly typical of the terroir associated with the Shenandoah Valley. Ten inches of rain in the late spring carried the vines through the early part of the summer, but some irrigation was still needed in late July to help the vines reach harvest in good condition. The crush started on August 17th with the Sangiovese destined for the Bray Brut Sparkling Rose, which was picked a week later than the 2016 harvest. The crush finished with both the last of the Brunello clone of Sangiovese and the last of the Primitivo in the middle of October, which was also a week later than last year. Overall, the quantity was up slightly which may account for the 7-day shift in time; with more fruit, ripening took a bit longer. The quality was good, and we think you’ll be as pleased as we are with this year’s harvest. The resulting wines, when released (the whites in 2018 and most of the reds in 2019), should be superb. Enjoy! Christmas Sales: In keeping with the holiday season, we are offering a special gift basket ladened with a bottle of our 2013 Barbera Port. Also included is a bottle of the Bray Vineyards Estate Olive Oil with attached pour spout. A great Holiday gift idea priced at $36. Our 2014 Bray Vineyards Petite Sirah is also on sale in a 3-pack for $45 ( a $27 savings). This aged Petite Sirah is now tasting at its peak, and will pare well with any number of traditional dinner recipes such as lamb or prime rib. Don't delay, there are only 9 cases left. Recipe: In need of a recipe for a simple healthy winter dessert, we turned to our friend Alison L. and her website at: Cookfoodmostlyplants.blogspot.com Her recommendation was a strawberry, chocolate, and port mixture that is as easy to make as it is to devour. Toss the sliced strawberries with the Port and mint. Spoon into serving bowls or glasses, and shave a little dark chocolate over the top using a microplane or carrot peeler. Will serve you, and anyone else you've decided that you really, really like that day. Trivia: Our Winter Newsletter Trivia section will delve into the origins of a wine style which today we refer to as Port. The story of Port’s development is intrinsically linked with the English and to really appreciate the history of Port it helps to know just a little bit of English history. The end of Roman rule in the 5th Century enabled Germanic tribes to invade and settle the southern and eastern parts of the British Isle. These Anglo-Saxon settlements are regarded by many historians as the origin of England and the English people. In 1066, William the Conqueror, Duke of Normandy and a vassal of the French King, invaded and conquered the Anglo-Saxon kingdom of England. He made himself King of England, and as was customary in that age, there was an intermingling of English and French royal families. This intermarriage process secured a kingdom spanning territory on both sides of the English Channel. William's heirs acquired numerous French estates along with their vineyards, and ruled them as Englishmen; a development that was not well received by the French Kings. One of these estates was the Duchy of Aquitaine which passed to English control when Eleanor of Aquitaine married Henry II. Aquitaine included the vineyards of Bordeaux and thus began England’s infatuation with claret. A dispute over land, the control of Flanders (northern Belgium), and the French support of the Scotts in their bid for independence led to war between England and France in 1337. Of course, it didn’t help that the English King, Edward III, claimed to be the rightful heir to the French throne. This conflict, known as the Hundred Years’ War (technically 116 years), was fundamentally all about kicking the English off the European continent. As English naval dominance on the high seas developed, the resulting mercantile wealth led to a taste for extravagance among the gentry. However, at the end of the Hundred Years’ War, France, as we know it today, was unified and England was evicted from mainland Europe. Imports of French wines were limited for political reasons, and availability was usually a function of what level of hostilities existed at any particular time. Even during times of war, French wine was available, but only from smugglers. The expense of contraband wines limited consumption to the very well off. In 1667, Louis XIV embarked on a series of measures to restrict the import of English goods into France. This provoked Charles II of England into increasing the duty on French wines, and later forbidding their import altogether. This trade war obliged English wine merchants to seek alternative sources of supply. The Iberian Peninsula was only too happy to fill the void. The tipping point came with the signing of the Methuen Treaty in 1703, which was colloquially referred to as the "Port Wine Treaty". This part military and part commercial treaty stipulated that no tax could be charged for Portuguese wines exported to England, or English textiles exported to Portugal, regardless of the geopolitical situation of each of the two nations. This was to make sure that England would still accept Portuguese wine in periods when not at war with France. Early commercial alliances between England and Portugal permitted the merchants of the other country to reside in its territory and trade on equal terms with its own subjects. Initially, the focal point of the burgeoning trade pact centered on the natural harbor of Viano do Castelo, located on the northern coast of Portugal. The commercial transactions involved a wide range of goods: English salt cod, wool and cotton cloth were exchanged for Portuguese grain, fruit and a wine know as “Red Portugal”. These wines, produced from grapes grown in Portugal’s cool wet coastal areas, were light, acidic, astringent, and not particularly to the liking of the English nobility. The Methuen Treaty was a game changer, and England experienced an explosion of imported wine. However, as demand outgrew supply, the English started a search for additional sources. They found what they were looking for approximately 50 miles east of the city of Porto in northwest Portugal. This area along the upper reaches of the Douro River is a unique vinicultural landscape of steep, schistous hillsides that have produced wine since the 2nd Century B.C. Building on this Roman foundation, by the 17th Century, the Portuguese vintners along the Douro had developed a strong tradition of exceptional wines far superior to those being produced along the coast. The entire Douro Valley has a unique microclimate perfect for cultivation of grapes. The valley is shielded from the rain-laden winds blowing off the Atlantic by the Marão Mountains, and has hot dry summers and severe winters. The flaky, arid soil presents unique challenges for winemakers and most of the finest vineyards are planted on the steep hillsides bordering the Douro River and its tributaries. About two thirds of the vineyard area is planted on slopes with a gradient of over 30% and the Douro Valley is the only significant wine producing area in the world to practice hot climate hillside viticulture. The Portuguese wine trade exploded with transportation being the only real drawback. The wild, mountainous terrain meant that the Douro Valley wines could only be conveyed by boat down the river to the city of Oporto near the coast. From Oporto, ships would then carry the wine to England, sailing out into the Atlantic over the treacherous mouth of the Douro River. The English quickly shifted their center of commerce from the north, and by 1710, Oporto was the hub of the English wine trade. Although they came from the mountainous hinterland of the Douro Valley some 50 miles from the coast, the wines took the name of the city from which they were shipped, becoming known in Portuguese as Vinho do Porto, meaning ‘Oporto wine’, and in England as ‘Port’. The earliest recorded shipment of wine under this name took place in 1678. The actual aging and blending of most of the world's supply of Port wine takes place in the bustling suburb of Vila Nova de Gaia which lies opposite Oporto on the steep south bank of the river. The true home of Port has over fifty wine companies based in its narrow, twisting streets. The port of this era was not the same beverage we know today. There are several folklore legends concerning the development of fortification, but the reality was more likely the confluence of three factors. The first was initially a technical measure to enable the wine to survive the long journey from the Douro Valley to wine cellars of England. To protect the wine during the long sea voyage it was sometimes ‘fortified’ prior to shipment with the addition of a small amount of grape spirit, or brandy, which increased its strength and prevented it from spoiling. This initial fortification was on the order of only about 3% and it was not universally practiced. Most Port wine was not fortified at all. The second factor concerned the development of the wine bottle. Prior to the 18th century wine was shipped and stored in hogsheads of anywhere between 60 and 140 English gallons. Early 18th century bottles were bulbous, broad bottomed and short necked. They could stand upright but could not be laid on their sides. Their main purpose was to carry wine from the tavern owner’s hogshead to the table and, once empty, they would be sent back for re-filling. A bottle often bore the initials or crest of its owner. The system was inefficient and the wines susceptible to spoilage due to oxygen exposure in half full barrels. Over the decades, as production techniques evolved, bottles became progressively slimmer and more elongated, with longer less tapered necks. By the 1770s, bottles had become sufficiently cylindrical to be stored on their sides. The prosperity of the Industrial Revolution during last years of the 18th century released the capital necessary for the wealthy to accumulate stocks of wine, and mature them for longer timeframes. The superior ageing potential of Port wines that had been fortified became readily apparent, and the practice of fortification increased. No one knows exactly when Port, as we know it, appeared, but sometime during the early 1700s someone came up with the idea of stopping the fermentation with brandy while the wine was still sweet, fruity, and strong. As the century progressed, the practice became more common. The resulting wines were sweeter, stronger, more aromatic, and had a greater appeal for the English consumer. However, not all merchants encouraged the practice. Nevertheless, while gradually gaining acceptance, the turning point may have been the exceptional harvest of 1820 which produced Ports so magnificent that subsequent vintages could not approach their richness and power unless they were fortified. Not everyone thought fortification was a good idea. One of the fiercest opponents of fortification was the famous Baron Forrester, a legendary figure in the history of Port wine. He believed the quality of Douro wines could stand on their own and he campaigned vigorously against fortification. In 1862, the Baron was lunching up river with Dona Antónia Ferreira, founder of the Ferreira Port house, and Baroness Fladgate, wife of John Fladgate, Baron of Roêda. After lunch, as they traveled down through the infamous rapids of the Valeira gorge their boat hit a rock and capsized, throwing passengers and crew into the fast running water of the rapids. The ladies survived, their air filled crinolines buoying them to safety, but Forrester, possibly weighed down by the gold sovereigns in his money belt, was never found. Forrester was a man of great determination and, had he survived to convince his colleagues of the error of their ways, the practice of fortification may have been modified. In any event, by the latter half of the 19th Century the practice was nearly universal, and Port had become the iconic fortified wine that we know today. Until relatively recently, the Port wine trade was reliant on the river to bring the wines down from the vineyards to the ‘lodges’ of the Port shippers at Oporto near the coast. The Douro flows in a typical pool and drop manner similar to the Colorado River. Calmer sections alternated with treacherous shoals and turbulent rapids, often grouped in series with some gushing through narrow, sheer-sided gorges. These rapids constituted a formidable sequence of obstacles, and required great skill to negotiate successfully. Throughout most of the Douro’s history, the vessel which carried out this work was the Barcos Rabelos, a boat with a flat-bottomed hull and a long steering oar, operated from the top of a raised platform. This arrangement allowed the crew to carry out the very precise maneuvers necessary to traverse the rapids. The boats were also fitted with a broad sail to assist it in making the journey back upstream. In the faster running reaches, they would be hauled against the current by teams of oxen straining on a towpath. The highly skilled and courageous crews constituted closely knit communities with their own distinctive traditions and customs. As trade increased the number and size of the Rabelos increased with some of the larger vessels carrying up to 100 casks. However, these larger craft were difficult to maneuver and prone to serious mishaps. Legislation in 1779 restricted the size to 70 casks but Rabelos of 50 casks were the most common. In 1887, completion of the railway along the Douro provided an alternative means of transportation but the Rabelo remained the method of choice for decades with 300 vessels still registered in 1930. As access to the Douro Valley improved, road transport began to take over and the last commercial journey of a Rabelo took place in 1964. In Portugal, over 100 varieties of grapes are officially sanctioned for Port production, but only five are widely cultivated and used: Tinta Barroca, Tinta Cão, Tinta Roriz (Tempranillo), Touriga Francesa and Touriga Nacional (the most celebrated Port grape). In the United States, there are no such restrictions, and the choice of what grape varietals to use is left to the discretion of the winemaker. The use of the word “Port” on the label is a different matter altogether. In 2005, after 20 years of negotiations, the European Union and the United States reached a bilateral accord concerning the use of 17 different “names of origin” on wine labels. These names are considered geographic locations on Europe labels, but were merely semi-generic descriptions in the US. Subsequently, American wine makers could no longer use wine labels that described their wines as Champagne, Chianti, Port, etc., but would be grandfathered if the wine was produced prior to 2006, which is the case with the Bray Vineyards Ports. There are a number of different designations describing Ports that may sound confusing, but in practice are really rather simple. Most Ports are blends of several different harvests unless designated as vintage with a year posted on the label. Ruby Ports are aged for 2-3 years before bottling, and have a deep red color, and taste young and fruity. Tawny Ports typically spend anywhere from 4 to 7 years in a barrel and pick up a light brown color from both the oak and oxidation while aging. They have flavors of wood, nuts, and dried fruit. Bray’s Ports are Ruby Ports and are ready for consumption when purchased. A final tidbit about the Bishop of Norwich and the Hoggit: at the end of formal 19th Century dinner parties, Port decanters were sometimes passed around the table with each guest expected to charge his own glass and pass it on. If a guest failed to pass the decanter on to his or her neighbor, the toasting would come to a standstill. This usually happened because either a guest did not notice that the decanter was in front of them, or they did not realize that they should pass it along. More rarely, it was because they hoped that no one would notice and they could secure a second glass. Guests waiting further down the table for the decanter to arrive would become impatient, but it was considered bad form to demand that the decanter be passed on. Instead, the person who is preventing the decanter from continuing its journey round the table is asked politely ‘Do you know the Bishop of Norwich?’ This is a gentle reminder to get the decanter moving again. The origin of ‘Do you know the Bishop of Norwich?’ is attributed to Henry Bathurst who was Bishop of Norwich from 1805 to 1837. Bishop Bathurst lived to the age of 93 by which time his eyesight was deteriorating and he had developed a tendency to fall asleep at the table towards the end of the meal. As a result, he often failed to pass on the Port decanters, several of which would accumulate by his right elbow to the consternation of those seated further up the table. A bon vivant said to possess a prodigious capacity for wine consumption, he was sometimes suspected of using these frailties to his advantage. The Hoggit was a simple expedient used to prevent anyone from having to invoke the Bishop of Norwich. It was a round-bottomed decanter which can only stand up when resting on a wooden support placed on the table to the right of the host or hostess. As it cannot be put down, it is passed directly from one guest to another. This ensures that it travels around the table in one continuous movement without stopping, until it returns to its base at the head of the table. Tasting Room: Our tasting room is open on weekdays (except Tuesday) from 11 to 4 and from 10 to 5 on weekends. In December, the tasting room will be pouring: the ’16 Brayzin Hussy Blonde, the ’16 Barbera Rosato, ’14 Brayzin Hussy red, the ’14 Alicante Bouschet, the ’12 Petite Sirah, and the ’13 Barbera Port. We also have a red table wine available in a refillable one-liter bottle emblazoned with Bray’s tractor logo. In the Vineyard:That all-inclusive term, “canopy management”, is the primary focus in the early days of summer. Our spring pruning determined the initial framework for growth with the goal of spacing the shoots 6-9 inches apart. However, the vines are genetically programmed to grow, and that growth is not always conducive to producing quality fruit. Grapevines do not form terminal buds like some plants, but will continue to grow as long as there is sufficient heat, soil moisture, and nutrients. For most varietals, a ratio of 14-20 leaves for every cluster of fruit is a general rule of thumb. Growth that exceeds that ratio impedes the vines ability to properly ripen the fruit and can disrupt airflow, increasing the potential for fungal growth. The first step in the process is the mid-spring suckering. This removes shoots from the base of spurs, multiple shoots from the same node, or shoots growing from the trunk which are fruitless but consume precious water. In early summer, the activity centers on removing excessive primary and lateral growth from the sides and tops of the canopy. As the season continues, the focus is on repositioning the remaining canes within the trellis system to optimize both airflow and sunlight for the clusters. Even in a dry summer environment, the vines generate enough moisture through transpiration to foster mildew formation in an improperly ventilated canopy. During mid-summer, canopy management is concerned with leaf removal in and around the cluster zone. The goal is not to completely strip the foliage from around the fruit zone but to provide between 40 and 60 percent exposure of the clusters. Care must be taken because leaves directly above the cluster on the shoot are the primary source of carbohydrates for development. In addition to creating a more favorable micro-climate during the heat of the summer, the sunlight exposure warms the berries, which enhances the sugar content while reducing pH and titratable acidity. At the same time, some varietals have their clusters thinned by removing the first prominent branch on the rachis stem (the central stem of the cluster). These initial branches are referred to as shoulders, and their removal can lower cluster weight by as much as 5%. Additional thinning removes any excess clusters (more than two per shoot), as well as dropping any seconds (late blooming & smaller clusters). This reduction in volume allows for a more even ripening of the fruit left on the vine. If done properly, the vines will be in balance with just enough canopy to provide the nutrients and shade necessary for a quality and perfectly ripened crop. This past spring, Bray Vineyards released our first sparkling wine. This 2016 Sangiovese Brut Rose subsequently received the Best of Class Gold Medal for Sparkling Wines at the Amador County Commercial Wine Competition. The obvious trivia question is: “how many ways are there to make Champagne”. The correct answer, particularly if you’re a Francophile, is only one. Champagne is a sparkling wine that can only come from the Champagne Region of France, and it must be made in a very specific manner known as “La Méthode Champenoise”. The process consists of adding the “liqueur de triage” which is a dosage of yeast and sugar to a bottle of already blended dry fermented wine which is then capped. This dosage triggers an additional fermentation which traps the CO2 in the capped bottle. The spent yeast solids are moved to the neck of the bottle by inverting and riddling (or “remuage”) which is simply twisting the bottle by a ¼ turn repeatedly over time. The sediment is partially solidified by dipping the bottle in an ice bath and then disgorged when the cap is removed. The bottle is subsequently topped off with a final dosage known as "liqeuer d' expedition" which will determine the final sweetness level of the champagne. The wine is then corked, caged, and labeled. If a wine is produced in France by this exact same process, but is not done in the Champagne Region, the French call it “Cremant”. There are three other ways to make sparkling wine other than the Méthode Champenoise. In the “Transfer Method”, the process is identical up to remuage where the wine is emptied from the bottle into a pressurized tank. The sediment removal and dosage steps are then done in bulk (with less labor) before being recorked, caged and labeled. The finished product is fairly indistinguishable (much to the chagrin of the French) from the traditional method. In the “Charmat” (or tank) Method, both the first and second fermentation are done in a pressurized tank. This process is fast, cheap, and not very labor intensive, but the flavor from sitting on the lees is somewhat less apparent. The last method is the cheapest method, and is through direct injection of the carbon dioxide into the wine. The same process used to add carbonation to a soda. Direct injection produces wines with large bubbles that dissipate quickly. The Méthode Champenoise for historical reasons allows for seven different grape varietals in champagne, but modern champagne houses typically use only three: Pinot Noir, Pinot Meunier, and Chardonnay. The other seldom use grapes are Pinot Blanc, Pinot Gris, Petite Meslier, and Arbane. Champagne can be made with various levels of residual sugar as determined by the sugar concentration of the “liqeuer d' expedition”, but producers quickly learned that consumers preferences varied widely. Over 90% of modern production is typically labeled as Brut which allows for a residual sugar (RS) level of 12 g/L which is equivalent to 1.2%. For reference, White Zinfandel is usually bottled with a residual sugar level of between 20-30g/L or 2.0 to 3.0% RS. Up-coming Events: It’s not too soon to mark your calendar for the fall “Big Crush” which will be celebrated on October 7-8th this year. The specific details of this event will be provided in our Fall Newsletter. Tasting Room: The cosmetic overhaul of the Bray Tasting Room is now complete with a down home, but stylish décor that we think you’ll like. New art, new glasses, a new floor, and new bottle racks were part of the upgrades, but we’ve changed more than just our look. Several of the wines now available for tasting are new releases; including the Sangiovese-Rose Brut Sparkling Wine, the ’16 Brayzin Hussy Blond, the ’14 Brayzin Hussy Red, and the ’16 Barbera Rosato. Also, currently available for tasting, but selling fast, are the ’16 Verdelho (Double Gold, Best of Class Amador County Fair), the ’12 Sangiovese La Dama Oscura, the ‘12 Double Barrel Barbera, and the ’07 Petite Sirah / Zinfandel Port. Additionally, we are excited to offer you the ability to taste “Fate Wines” on weekends. Fate is the label of Thomas Allen, a sommelier at Taste Restaurant and our very own assistant GM. Thomas makes his wines under a custom crush arrangement, and uses his expertise to bring a different style to the high quality grapes grown at Bray Vineyards. We think you’ll enjoy the opportunity to sample two different labels under one roof. Give us a visit and let us know what you think! In the Vineyard: February is always a good time to take a mid-season look at the winter rainfall totals. The Western Regional Climate Center collected weather data for Plymouth, California from 1943 until 1963. During that 20 year period, 1950 registered the highest rainfall total at 41.5 inches. This year, through mid-February, our gauges have totaled over 39 inches of rain, and with the forecast for more storms in February, we could easily surpass the 1950 totals. A record year by any account, and 3 months of the rainy season still to go. However, it will be the soil moisture content which dictates whether or not the vines need a mid-summer drink. The wet winter will certainly delay that action. An additional side effect of the wet weather are the complications it brings to the start of the dormant season pruning cycle. The task which usually begins in February has been somewhat hampered by the rain. Care has to be taken to ensure that the mechanical equipment does not unnecessarily compact the wet soil around the vines. Around the Winery: We would like to take this opportunity to announce that Joel Medina has been given the official title of Winemaker at Bray Vineyards. Joel came to the Shenandoah Valley in 1997 from Acanbaro, Guanajuato, Mexico and until 2006 worked at the Deaver Flower Farm. He came to Bray’s the following year and worked with both the grape vines and general gardening duties. In 2008, Joel began his apprenticeship as a winemaker under the mentorship of John Hoddy, our head vigneron. John will remain as executive winemaker to oversee the Bray style while Joel accepts responsibility for the day-to-day operations of crafting our fine wines. The Bray winemaking team is augmented with inputs from our Consulting Winemaker, Marco Cappelli, and Thomas Allan, our assistant manager and also the sommelier at Taste Restaurant. Up-coming Events:March 4th and 5th is the Amador Vintners’ annual “Behind the Cellar Door” wine tasting extravaganza. Bray Vineyards will be joining 45 other wineries in presenting the best of the food-friendly wines of Amador County. Eric Burns will be serving his delicious meatballs with raspberry and roasted chipotle sauce over polenta. We will be sampling a barrel of our 2014 La Dama Oscura, a Brunello clone of Sangiovese, alongside a barrel of our 2014 Sangioveto clone of Sangiovese. Learn to discern the different characteristics between clones of this important Italian varietal. Both the Brayzin Hussy Blonde, and Brayzin Hussy red will be available for a special event discount of $99 per case. Feel free to mix and match in order to get your perfect combination. 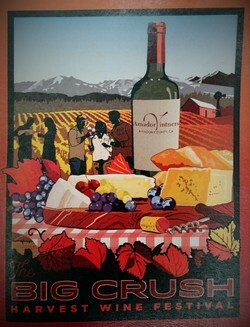 Visit the Amador Vintners Association website at: Amadorwine.com for tickets and event details. Presale tickets are $55 for both days, $45 for Sunday only and $10 for a designated driver. These will be available online until February 28th at 11:00 pm. Tickets can be purchased the day of the event at participating wineries for an additional $5 each. Trivia: What grape varietal has the potential to express the bracing acidity and minerality of Riesling, the floral bouquet of Pinot Gris, and the mouthfeel and fruit of Viognier? The answer is Albarino, Bray Vineyard’s newest varietal, and the subject of this month’s newsletter trivia section. A source of high quality white wines from the Iberian Peninsula, Albarino is an important cultivar that is both morphologically diverse, and subject to a considerable amount of name confusion. The grape is known as Albarino in the Galicia region of northwest Spain, (Galicia is an autonomous area of Spain, containing several provinces and located directly north of the Portuguese border). The grape’s name changes to Alvarinho when you move south across the border into northwest Portugal. Although these two similarly named grapes are in fact genetically identical, there is considerable doubt about other synonymous varietals. Two in particular, Cainho Branco (from Portugal) and Cainho Blanco (from Galicia), were once thought to be morphological divergent strains of Albarino. The DNA analysis says otherwise, and the current evidence indicates that these two grapes are the same varietal but a completely separate cultivar from Albarino. To add to the confusion, there are regions in northwest Spain growing grapes that are locally known as Albarino but which are genetically related to a grape named Savagnin which itself is genetically identical to Gewurztraminer. Albarino displays a large amount of morphological diversity which is usually considered an indicator of an ancient grape varietal. As with most old varietals, there is always some unsubstantiated romantic folklore associated with their time and place of origin. In Albarino’s case locals thought the grape to be of German ancestry because the name “Alba-Rino” translates as “the white from the Rhine”. Riesling was thought to be the parent grape. After all, there are some very noticeable similarities between the two grapes, both in the morphology of the vine, and in physiological characteristics of the finished wine. Legend has it that the 12th century Benedictine Monks from the monastery in Cluny, Saône- et Loire, France brought the grape to Spain during a pilgrimage to Santiago de Compostela, the Capitol of Galicia and alleged burial site of Saint James the Apostle. Unfortunately for the romantics, the earliest documented records of Riesling date from the 15th Century, and recent DNA analysis shows zero correlation between the two varietals. There is a partial DNA relationship with another old Iberian varietal called Louriero, but whether it is as a parent or sibling is unclear. It also has a close DNA relationship to the Malvasia Fina grape which was documented growing in the Minho Provence of northwest Portugal as early as 1790. The Malvasia family of white wine grapes are thought to have originated in Greece. However, there were no written references to Albarino in Galicia until 1843 when a document referred to a parcel of 40 vines that were thought to be between 200 and 300 years old. If true, that would certainly indicate that Albarino has been grown in northwest Spain for a very long time. Immigrant, indigenous, or crossbred from both, the exact ancestry of Albarino, like many European varietals may never be definitively established. A case in point: there are currently over 80 cultivated modern grapes that can trace part of their ancestry to Gouais Blanc an old prolific varietal grown by peasants in medieval times. However, much of that lineage is still conjecture owing to numerous parent grapes being extinct and unavailable for DNA analysis. Today, the premier growing region for Albarino is the Rias Baixias Denominacion de Origen or DO (a Spanish classification similar to an appellation, but which covers other food products like cheese). Albarino accounts for over 90% of the wine grapes grown in Rias Baixias which is further divided into 5 distinct sub-regions; each with their own micro-climate and winemaking traditions. Subject to a maritime influence from the Atlantic Ocean, the region’s overall climate is cool, humid and very wet with annual rain totals sometimes exceeding 70 inches. Albarino is a thick skinned grape with tight clusters, and the damp climate requires care to prevent powdery mildew. Growers typically train their vines on high trellises or pergolas to provide plenty of air circulation but even then a stringent spray regimen is required. While the wines styles can vary by sub-region, they all tend to be bone dry with a pale golden color, crisp acidity, and alcohol levels around 12%. Aromatic profiles can include white peach, apricot, melon, pineapple, mango and honeysuckle. Traveling south into northern Portugal, Albarino (Alvarinho) is one of a number of white grapes permitted in the Vinho Verde DOC (denominação de origem controlada: the Portuguese appellation system for agricultural products). In the early 16th century the Portuguese established regulations designed to maximize the production of maize. As a result, grape vines were restricted to the margins of fields and grown around the trunks of trees and draped over bushes surrounding fields that were used for other purposes. Today, there are still some vineyards that are relics of this practice, but most vineyards have transitioned to traditional trellis systems. One aspect of viticulture that has not changed is the Portuguese practice of over cropping the vines. High yields coupled with a cool maritime climate result in grapes with less than optimum ripeness, and wines with alcohol levels less than 10%. Vinho Verde literally means “green wine” but actually translates as “young wine”. Most of the whites, Albarino included, are destined to be blended into this early drinking low alcohol wine. These wines are sometimes bottled with a little CO2 added to give them a light sparkling and refreshing sensation in the mouth. In two smaller sub-regions of the area, Monção and Melgaco, Albarino is destined for single varietal wines with higher alcohol, and those grapes are carefully nurtured to achieve the optimum ripeness necessary for that style. Fortunately, with the grape being a more recent arrival in California, vintners here avoided the Albarino identity crisis. According to the California Grape Acreage Report, there were less than 2 acres planted prior to 2001, with a gradual expansion to 280 acres by 2015. Today there are vineyards in the Santa Ynez Valley, Clarksburg, Napa, Edna Valley, Los Carneros, and in Amador’s Shenandoah Valley. While the climate of these areas is markedly different than Spain’s Rias Baixias region, the vinicultural practices, particularly in regard to lower yields, may be more in line with Albarino’s needs. The Bray Vineyards Albarino was grafted over to established rootstock and we have 220 vines that are now 3 years old. Selective pruning kept the 2016 crop small and in balance with what the young vines could support. We processed only enough grapes to produce 12 cases of wine for our first Albarino vintage. The inaugural release is scheduled for March at the “Behind the Cellar Door” celebration. This is a light, medium bodied wine with only 13% alcohol. The nose is predominately floral with hints of green apple, while on the pallet the refreshing acidity combines with overtones of honeysuckle and pear. This easy drinking Albarino will be a perfect summer time choice for hot lazy afternoons. The 2016 Grape Harvest: Instead of a separate section for the Vineyard and another for the Winery, we decided it might be interesting to recap the entire growing season from bud break to crush. To appreciate the intricacies of the 2016 Grape Harvest, it is important to understand the areas core terroir as it pertains to climate. The all-inclusive French term “Terroir” is defined as the complete set of local conditions in which a particular wine is produced. These particulars include more than just climate; they also delve into the soils, vineyard orientation, and microclimates of not just individual vineyards but sections within those vineyards. Such an analysis is beyond the scope of this newsletter. However; we can review the past year’s weather and reflect on how it affected the 2016 harvest. Climate is what you expect; weather is what you get. To ripen properly, Vitis Vinefera vines require a minimum of 200 sunny 8 hour days, 104 days with the temperature above 50o F, and at least 23 inches of rainfall for dry farmed grapes. These parameters are easily achieved in the various vineyards of Amador County, which in general has a Mediterranean climate. The varieties that thrive in such a climate will produce quality grapes, and if fermented with care, quality wines. This is why you’ll see lots of southern Rhone, Italian, and Iberian Peninsula grapes grown in our area. There are microclimates due to orientation or elevation where continental varietals from Bordeaux or Burgundy can thrive, but these vineyards are generally exceptions to the rule. The single most critical factor in assessing a growing season’s variation from the norm is sunshine. Think of the vine’s canopy as a solar array and the grape cluster as a battery. The vine uses photosynthesis to convert the sun’s energy to sugar which is stored in the grape. As a grape ripens, the acid content decreases, the sugar content increases, and those critical phenolic compounds also ripen but lag the sugar levels. As long as there is sunshine, the chloroplasts in the leaves are stimulated to produce color and sugar. Photosynthesis ceases at sunset, regardless of the ambient temperature. Phenolic ripening, on the other hand, is dependent on temperature not sunshine. An ambient temperature above 50oF marks the minimum to induce phenolic ripening, but that development can falter with temperatures above 100oF. This is particularly true if the vines do not have the chance to cool off at night. The downside to viticulture in a Mediterranean climate is that an excessively warm growing seasons can result in grapes that are fully sugar ripe before they achieve flavor maturity. The temperature specifics of the 2016 growing season were extremely favorable to the production of quality wine grapes. The specifics that follow are from the Accuweather data for the city of Plymouth at the western edge of the Shenandoah Valley. This is close enough to the vines at Bray Vineyards to give a reasonable approximation for the actual weather. While the spring temperatures fluctuated by wide margins, the last recorded frost was 18 February, well before bud break. Grape vines are self-pollinating, and each potential cluster contains hundreds of flowers of which, on average, only 50% set fruit and become berries. Weather can reduce that number and consequently the overall crop tonnage. For the most part it was warmer than normal this spring but later on turned cool and wet. If it is cool and overcast prior to bloom, then floral development can be adversely effected. If cooler during bloom, then progression can be delayed, and a reduced set of fruit results. Finally, rain during bloom can physically inhibit pollination and fertilization. This last condition, referred to as shatter, affected some varieties, but was not widespread or extensive. Having survived the vagaries of a Sierra Foothill spring, the grapes in our vineyard were to have almost perfect growing conditions for the rest of the year. In addition to the influence on phenolic ripening mentioned earlier, temperature also plays a role in the development of the grape’s acids and sugars. Tartaric and malic acids are produced by the grape as it develops. In warm climates, these acids are lost through the biochemical process of respiration. Therefore, grapes grown in warmer climates have lower acidity than grapes grown in cooler climates. Sugar production is the complete opposite of acid production. The warmer the climate, the higher the sugar content of the grapes. The overall summer temperatures were cooler than normal with only a single 3 day period in late July when they hovered around 100oF. This progression of warm but not excessively hot days allowed the grapes to ripen evenly while maintaining an appropriate balance of sugar, acid, and ripe phenolics. It was almost ideal. Our white varietals were harvested in mid to late August which is normal. As mention in the Fall Newsletter, we picked some Sangiovese in early August. These particular grapes were destined for our inaugural sparkling blush wine. Champagne style wines are typically made from grapes with lower sugar and higher acidity levels, hence the early harvest. We are really excited about this wine and it should be ready for release in the spring of 2017. Our harvest of red grapes started in mid-September with Cabernet Sauvignon and continued unabated through the first week in October with the final variety being Black Muscat. Every 2 to 3 days, depending on grape chemistry and equipment availability, another batch of grapes would find their way to the crusher. The final tally during a 94 day period was a harvest of almost 93 tons composing 16 different varietals. It was a good year. Yield was down slightly in some varietals owing to the reduced fruit set in the spring, but overall the vines produced typical yields. This is good news for wine lovers because the 2015 tonnage per acre was reduced, most likely as a vine response to the extended drought. Overall in 2016, the vines were happy, and the grapes they produced were of exceptional quality. The resulting wines, when released (the whites in 2017 and most of the reds in 2018), should be superb. Enjoy! Holiday Sale: In keeping with the Holiday spirit, and in conjunction with the Amador Vintners Association’s “Joy, Peace, and Zin”, we are celebrating with our own seasonally priced special. Purchase a six pack (3 each) of our 2012 Primitivo and 2013 Zinfandel for only $90 (offer is good through December 31st). These two clones of the Croatian grape Crljenak Kaštelanski are similar in that both have luscious dark fruit flavors, but are decidedly different with one having stronger spice and clove overtones. Can you tell them apart? Have a little extra fun at your Holiday gathering and serve them both in a blind tasting. Happy Holidays from Bray Vineyards! Recipe: Looking for a satisfying winter recipe to pair with that six pack of Zinfandel and Primitivo? Our friend Alison, at cookfoodmostlyplants.blogspot.com, has a delightful and healthy winter combination that should do the trick. Her recommendation is a combination of pasta, braised kale, butter beans and Hazelnuts. The dish is layered with goat cheese and you could even experiment by adding a few sun dried tomatoes and pair it with the Bray Barbera. - In a wide sauté pan heat oil over medium heat. - Sprinkle with salt, add a slosh of broth, and continue to cook for 5-10 minutes. - Add the beans and squash to the kale. Cook for about 5 minutes, stirring occasionally and adding another slosh of broth when it starts to dry out. Add the sage and lemon zest, stir, and turn off the heat. - Drain the pasta, toss it with the kale mixture, and sprinkle in the goat cheese. Stir once or twice before serving. Top with freshly ground black pepper and a light scattering of chopped hazelnuts. Tasting Room: Our tasting room is open every day except Tuesdays from 10:00 a.m. until 4:00 p.m. In December, we are pouring: the ’14 Brayzin Hussy Blonde, the ’15 Verdelho, the ’11 Brayzin Hussy red, the ’13 Barbera, the ’12 Vino Tinto, and the ’07 Petite Sirah/Zinfandel Port. We also have a red table wine available in a refillable one-liter bottle emblazoned with Bray’s tractor logo. The Crush: We’ve combined the Vineyard and Winery sections for our Fall Newsletter, because at this time of year there is little difference between the two. All the functions of Bray Vineyards coalesce around what we call “The Crush”; our favorite time of year. This has been atypical, that is to say, another great summer for growing grapes in the Shenandoah Valley. Although we did have a number of warmer periods with temperature spikes around 100 degrees, the delta breeze kicked in, as usually happens, modifying any potential negative effect on the vines. Our white varietals were picked in mid-August, which is normal, and their must is now slowly undergoing fermentation in the glycol cooled stainless steel tanks. A fermentation at lower temperatures preserves the lighter aromatics of the Verdelho and Viognier varietals, and the slower pace allows more lees contact which adds complexity to the wines. Our red varietals are rapidly approaching their peak ripeness and flavor, and harvest will occur in a staggered fashion from the middle of September on into early October. The lone exception is a section of our Sangiovese which we picked in early September. These grapes are destined to make a sparkling blush wine. Champagne style wines are typically made from grapes with lower sugar and higher acidity levels, hence the early harvest. We are really excited about this wine and it should be ready for release in the spring of 2017. If you have not visited Bray Vineyards in a while, then you are in for a pleasant surprise! We have given our tasting room a modest makeover. The new décor presents a more contemporary appearance while preserving that down-home comfort that is the mark of our friendly approach to wine tasting. We think you’ll like the changes. Our Fall Wine Club Release is tentatively scheduled for Saturday, November 12th from 2:00 pm to 6:00 pm. Eric Burns will be demonstrating his expertise at the grill with his famous BBQ’d oysters, while Steve Waranietz will be on hand with songs and his unique talents on the keyboard for your entertainment. There is no charge for Wine Club Members, and the fee for guests is $10.00 per person. Please RSVP no later than October 31st. Trivia: One of the smaller plantings of Vitis Vinefera at Bray Vineyards is Cabernet Sauvignon, and this month’s trivia section will delve into its origin and history. A relative newcomer on the Vitis Vinifera scene, Cabernet Sauvignon has been around for less than 250 years. Not a long time for a varietal that has become the most planted red wine grape in the word with slightly over 721,000 acres in cultivation. Thanks to a DNA analysis preformed in 1969 at UC Davis by Carole Meredith, we now know that this important varietal is a cross of Cabernet Franc and Sauvignon Blanc. This seems to be obvious in retrospect, since the name Cabernet Sauvignon would appear to be a combination of the names of its two parent grapes. However, what is not generally appreciated is that the cross fertilization of the two parent vines was purely accidental and that the exact time and place is unknown. Historians now believe this spontaneous cross occurred sometime before the mid-18th century, and somewhere in the Gironde Department which includes the Bordeaux region in Southwest France. (A French Department is an administrative subdivision of the French Government,similar to a U.S. county). Like most varietals with uncertain origins, a paucity of facts didn’t prevented Cabernet Sauvignon’s past from being augmented with undocumented conjecture and romantic myths. One theory, which appealed to local pride, was the idea that the varietal was a wild grape native to France. The sole corroboration of this theory relied on the fact that the word “sauvignon” was thought to be derived from the French word “sauvage” meaning wild. Unfortunately for the local boosters, native Vitis Vinifera vines have never been recorded in the Gironde area, which would preclude Cabernet from being a native grape. Early on, there was some speculation that Cabernet could actually be the famous “Bituric” vine described by Pliny the Elder in his description of ancient Roman wine culture. Given the prolific nature of the wine trade between Rome and its settlements on the Iberian Peninsula, it does offer a plausible avenue for how Cabernet was introduced into the Bordeaux region. However, in reality, one could conceivably argue that any popular varietal bore at least some resemblance to a very general description in some ancient Roman text. Still, this ancient origins hypothesis was prevalent in the 18th century, and Cabernet was often referred to as Petite Bidure, with Bidure being a possible corruption of the word Biturica. The earliest written documentation of Cabernet was found in an account book kept by the Mayor of Libourn and written sometime between 1763 and 1777. The entry lists the varietal as “Petite Cabernet”. By the late 18th Century, Cabernet was becoming a popular Bordeaux varietal, and a 1784 grape catalogue listed it as “Gros Cavernet” with the description of it being a “black, top quality for making good wine, rather productive, and deeply colored” grape. Early on, Ampelographers noticed several morphological similarities between the leaves and wood of Cabernet and Sauvignon Blanc, while winemakers noted that Cabernet also shared some of the aromas of both Cabernet Franc (blackcurrant, pencil box) and Sauvignon Blanc (herbaceous, grassiness). Perhaps these similarities were responsible for the evolution of the “Gros Cavernet” name into Cabernet Sauvignon.The first mention of the modern Cabernet spelling,however, didn’t occur until nearly a hundred years later in 1840. The wine world was surprised when Cabernet Sauvignon’s genetic parentage was established, because at the time no one thought you could get a black grape with one white berried parent. Interestingly, in 1977 a Cabernet vine at Cleggett Wines in Langhorne Creek, South Australia mutated and started producing pinky-bronzed berries and was registered under the name “Malian”. In 1991 a vine propagated from “Malian” started to produce white berries and was registered as “Shalistin”, bringing at least one clone of Cabernet full circle and back to being a white grape. Records indicate that the first estates to begin actively planting Cabernet Sauvignon were Château Mouton and Château d’Armailhac. Both vineyards were in Pauillac, and on the west or “left” bank of the Gironde River. These two vineyards were also the most likely source of parent vines used to spread Cabernet throughout Bordeaux. Cabernet eventually became the dominant grape on the left bank of the river, while its half-sibling, Merlot, dominated the blends of the”right” bank. In 1855, Napoleon III requested a classification system for France’s best Bordeaux wines based on both the Château’s reputation and the wine's trading price. The five First Growths, or Premier Crus, were all on the left bank where Cabernet Sauvignon usually comprised at least 70% of the Bordeaux blend. In all likelihood, it was this dominance in the blends of the Premier Crus wines of France,and the impetus to imitate them that saw Cabernet Sauvignon planted in all the major wine growing regions of the world. Imitation may have been the initial reason for the surge of world-wide Cabernet plantings, but it would not have been enough if the varietal did not also possess several other admirable characteristics. Ease of cultivation was certainly important. Cabernet’s vines are hardy and adaptable to a variety of climates, and they produce thick skinned berries resistant to both insects and rot. The vines are also late to bloom which helps in avoiding frost damage. However, Cabernet’s main selling point is the ability to consistently produce wines that have the character, structure and flavor typical of the varietal. This typicity means a Cabernet, whether grown in Bordeaux, Australia or the Sierra Foothills, is still instantly recognizable as a Cabernet. Initially, soil was thought to be a critical aspect of the terroir for growing quality Cabernet. The varietal did significantly better on the gravely soils of the Gironde’s left bank than it did in the clay and limestone-based soils of the right. Inasmuch as Cabernet has thrived world-wide in a variety of soils, it is now believed that the gravelly soil of the left bank better retained the heat that helped the grapes ripen fully. The degree to which the fruit ripens is the key difference between the different Cabernets of the world, and that is, of course, a function of the growing climate. A late-budding grape like Cabernet will also reach full phenolic maturity later in the season and can fall short if the growing conditions are not favorable. The predominate Cabernet aromas in cooler growing regions are black currant, mint, cedar and varying levels of bell pepper. In warmer climates, the black currant is joined by black cherry and black olive with noticeably less herbaceous overtones. In hot climates, the black currant can veer towards over-ripe or jammy. The green bell pepper or herbaceous aroma is caused by the chemical pyrazine which is present in all Cabernets, but is gradually destroyed by sunlight as the grape ripens. Pyrazine is not considered a fault by itself, but it is also not to everyone’s liking, so fully-ripe grapes are considered more desirable. Mint flavors tend to be associated with regions warm enough to eliminate the pyrazine, but still be classified as generally cool. Some winemakers believe that warm climate herbaceous notes may be a characteristic of the soil type. In cooler climates, less-ripe Cabernet grapes are often blended with fruitier varietals like Merlot to mask the pyrazine. The classic profile for a Cabernet Sauvignon is that of a full-bodied and tannic wine with crisp acidity. These attributes gives the wine excellent aging potential. However,quality and ageability can be affected by several choices made either in the vineyard or winery. Originally, Cabernet was considered a low yielding variety, but vines planted on modern Phylloxera-resistant rootstock tend to produce higher yields with a resultant loss in flavor and concentration in the wines. This is often countered by thinning the crop shortly after veraison, or in some cases, replanting on less vigorous rootstock. Early French Bordeaux’s were so tannic as to be unapproachable in their youth. This had less to do with the grapes natural tannins than early French winemaking practices. Tradition dictated a three week maceration period on the skins prior to fermentation which allowed ample time for the staff to close down the winery and take a short hunting vacation. Today, modern winemakers can easily control the tannic content of the Cabernets by controlling punch-down techniques, pre and post-fermentation skin contact, and pressing strategies. The last piece of the puzzle is oak: how much and what type. The standard Bordeaux “barrique” is 225 liters (59gallons), and its success in France has helped make barrels of that size an almost universal world-wide standard. Cabernet Sauvignon, even more than other varietals, has an affinity for oak. The oak tannins soften and complement the harsher grape tannins and add complex notes of vanilla and spice to round out and complement the wine’s intrinsic aromas. American oak typically exerts a stronger influence on the wine than French oak does. Which one to use is often more a style consideration than anything else. It is what makes comparing different Cabernets from the same region fun. Cabernet Sauvignon made as a 100% stand-alone varietal is all the rage in California, especially among cult wine aficionados. The rest of the wine world takes a slightly different view however. Stand-alone Cabernets can be found in all major wine regions, but blending this versatile grape to mask its deficiencies and highlight its strengths is a more common practice. The classic "Bordeaux blend" is composed of Cabernet Sauvignon, Merlot, Cabernet Franc and occasionally, in small percentages, Malbec, Petit Verdot or Carménère. Different percentages of these grapes in different vintages have proven adept at rectifying any short comings the growing season may present with the individual grape varietals. However, even in warmer climates with more consistent growing seasons, Cabernet has been paired with other regional stars to produce complex, flavorful, and long-lived wines. Italy was introduced to Cabernet in 1820, but over the years the varietal was used sparingly in that it was a foreign grape that distracted from the elegance of the native varietals. All that changed in the 1970’s when outside the control of Italian wine laws (Denominazioni di origine controllata or DOC), Italian winemakers began to combine Cabernet with Sangiovese producing a blend they called “Super-Tuscans”. These blends caught on quickly and soon became some of the most sought-after and expensive wines in Tuscany. Eventually the DOC changed the rules, and today Cabernet can be legally blended with a number of different Italian varietals. The Spanish wine industry was famous mostly for its Sherries, also known as “sack”, which were produced in Jerez in southwestern Spain. The Phylloxera epidemic of the late 1800’s changed that, as consumers looked to Spain to replace the diminishing French production. French winemakers, grapes and techniques crossed the Pyrenees in the process. While political upheavals and wars later devastated the Spanish wine industry, Cabernet Sauvignon stuck around. The 20th century revival of Spanish winemaking has found a match for Cabernet and Tempranillo with the former providing structure and the latter adding notes of voluptuous fruit to the mid-palate. Unrestrained by tradition and with no indigenous grape varietals or appellation laws to contend with, the Australians were free to innovate. Initial attempts at winemaking in the coastal areas were hampered by too much rain and humidity, while vineyards in the western areas suffered from late frosts. The discovery of the Hunter Valley in 1797 provided an ideal environment for winemaking which was encouraged by the Government as a way of promoting sobriety. The concept being that wine had a lower alcoholic percentage than distilled spirits. In 1830 James Busby brought over 500 clippings back from Europe, including Syrah from Hermitage in the Rhone Valley as well as Cabernet Sauvignon from Bordeaux. The Australians have never looked back. Their counter-intuitive blending of two big wine varietals or “Cab-Shiraz” can produce wines of character and flavor that are greater than the sum of their parts. Due to variable micro-climates and different winemaking techniques, California Cabernets are all over the map, covering nearly every conceivable style. The current Bray Vineyards release is our 2011 vintage which was a cooler than normal growing season. Consequently, the wine’s mixture of black currant and blackberry has just the slightest suggestion of bell pepper and a touch of smoke on the finish. This is a medium-bodied and very approachable Cabernet with soft tannins and lively acidity. Visit us and try a taste! Website: Brayvineyards.com is the place to go for additional information on the winery, upcoming events, and past issues of this newsletter. It is also the online store for our current inventory of direct shipment wines, any available library wines, Bray logo clothing, and other winery paraphernalia. If you can’t visit us in beautiful Amador County, then perusing the website is the next best thing. Tasting Room: Our tasting room is open every day except Tuesdays from 11:00 a.m. until 4:00 p.m. In October our featured wines will be the 2012 Barbera and the 2012 Primitivo, both on sale during the week of the “Big Crush” for $99 per case. In addition to the lineup of wines offered for tasting, we have a red table wine available in a refillable one-liter bottle emblazoned with Bray’s tractor logo. With the grapes ripening and the harvest in full swing, now is a great time for a visit. We look forward to seeing you soon!